The leaves remind me of tiny little Aloe Vera leaves but the plant itself grows much differently, almost in curving vines of tiny Aloe leaves. It has never flowered (I've had it for aprox. 3 years). Comments for Mini Mutated Aloe Vera? This is an Aloe, and goes by either of two names, Aloe juvenna or A. zanzibarica. They typically grow in this way, with long stems, instead of the customary form of a single rosette, or groups of rosettes. You can see more about them here; Aloe. They require the exact same care as all other members of the genus; bright light, water only once in a while with enough to wet the whole soil column, after which it's allowed to dry almost completely. This species doesn't seem to flower often, if at all, so that's not a surprise. If it ever does, it will most likely have several blooms on a tall stalk, either pink, peach or red colored. There is more about how to grow them here. Oh, thank goodness! My daughter rescued one of these from her classroom at the end of fifth grade (she's a sophomore now) and it has grown and grown, but we never knew exactly what it was. 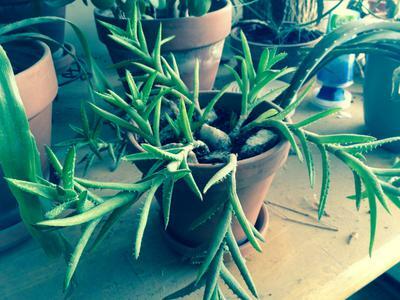 We were originally told Spiny Aloe, but when I looked that up, it's definitely not this guy (who we named Spike). Thank you! NOT a Juvenna or zanzabarica. My grandmother has had one since the 1950s. She recently gave me part of it to grow, its very similar to this. Mines a different breed but neither yours nor mine are a juvenna or zanzabarica. Still unknown but the two breeds it was "identified" as are tiger tooth aloe, if yours is anything like mine the teeth are very small, not jagged like a juvenna would be. -- Aside from that, mines a very light green with white spots, skinny and short (blades or leaves?) no more than 3.5" and grows out in hanging vines from the pot. but where yours is multiple (i guess you'd call them clusters) one after another to make a vine, mine is one long grey vine (some up to 11 inches)then it hangs out over the pot with a cluster at the end. Not sure what mine is called either. But hopefully somebody will give it a name.